Two years ago today, I married my best friend and soulmate. We have so much fun together and I wouldn’t change a thing about our marriage. For those of you who are married, you are probably familiar with traditional anniversary gifts. The two year anniversary traditional gift is Cotton. Cotton was not the easiest thing to create a good guy gift, but I had a lot of fun coming up with it. So if you are looking for a good Cotton anniversary gift, I’m happy to share mine. 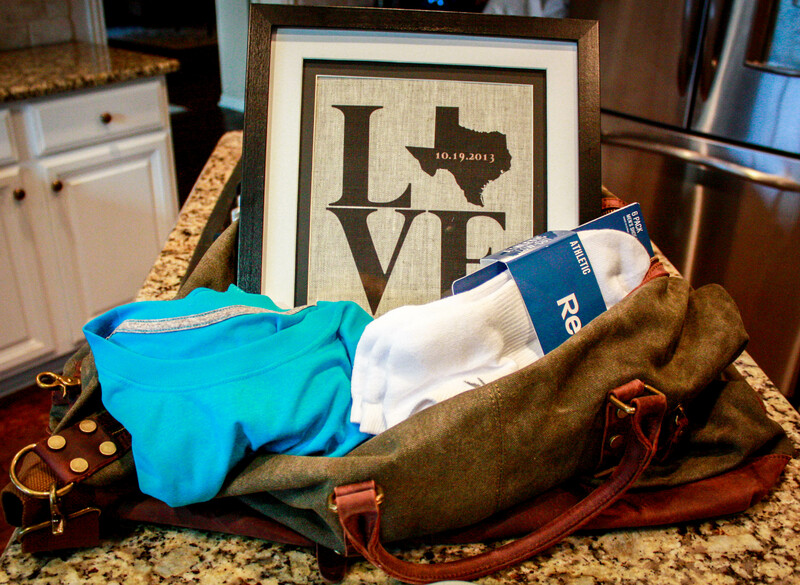 His gift included: (1) a “LOVE” graphic with our wedding date and state we got married in (and live in) printed on cotton and framed (purchased on Etsy); (2) a really nice canvas and leather duffle bag; (3) his favorite cotton dry-fit Nike shirt; (4) some new running socks; and finally (5) cotton candy cupcakes to top off my ultimate Cotton gift! 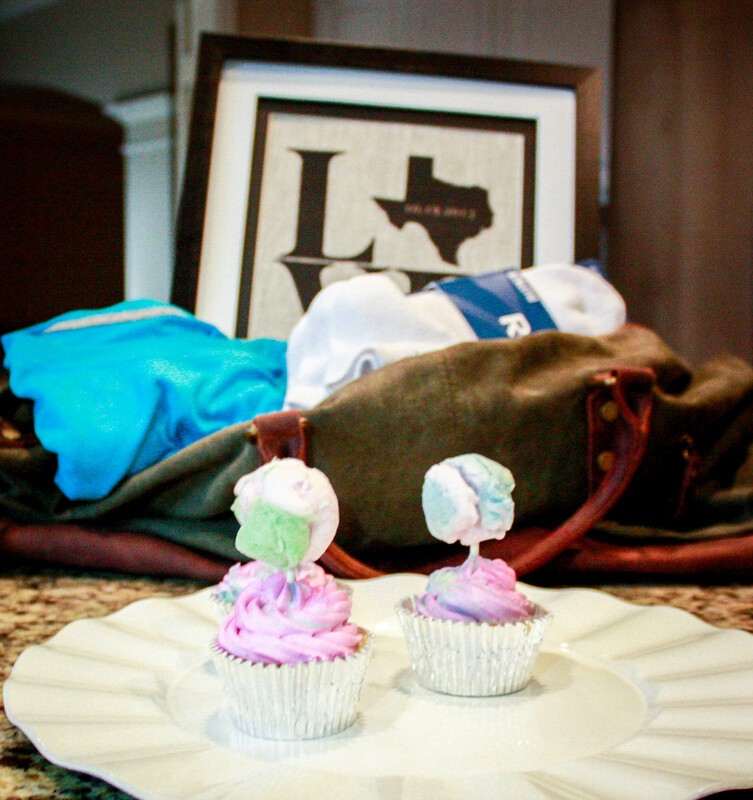 Obviously, I got a little carried away with the cotton theme… but I enjoy putting fun gift packages together. 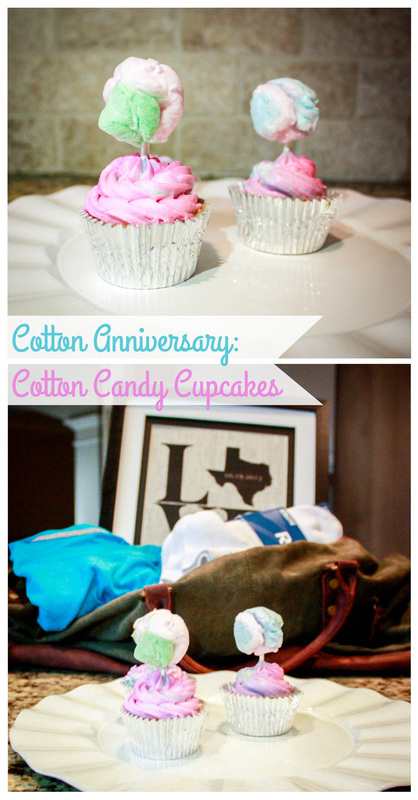 If you aren’t celebrating a Cotton anniversary soon, well these are also a great October treat to enjoy the Fair season! At least here in Texas, we make a pretty big deal out of our State Fair and our fair foods, and cotton candy is pretty much a staple fair food. Preheat oven to 350 degrees. Sift 3/4c all-purpose flour and 3/4c cake flour into a mixing bowl. Add 1 1/2t baking powder and 1/4t salt and whisk dry mixture, 20 seconds, set aside. In the bowl of an electric stand mixer, fitted with the paddle attachment, whip together 1/2c butter and 3/4c +2T granulated sugar until pale and fluffy. Mix in 1 egg, then mix in 2 egg whites one at a time, blending until combined after each addition and adding in 1 1/2t vanilla with last egg white. Working in three separate batches, beginning and ending with flour mixture, add 1/3 of the flour mixture (to the butter/egg mixture), alternating with 1/2 of the 1/4c + 3T milk and mixing just until combined after each addition. Divide batter among lined cupcake pan, filling about 2/3 full (about 1/4 cup batter in each). Bake until toothpick inserted into center of cupcake comes out clean, about 18 – 21 minutes. Cool in baking pan several minutes then transfer to a wire rack to cool completely. In an the bowl of an electric stand mixer fitted with the paddle attachment, whip 1c butter until pale and fluffy. Mix in 2T cream, 1/2t cotton candy flavor (or 1 1/4t vanilla and 1/2c cotton candy) and 2 1/2c powdered sugar (adding additional cream 1 tsp at a time as needed). I honestly couldn’t find cotton candy flavoring at any store and refused to buy it on amazon but the alternate method works well. Whip until light and fluffy, tint with pink or blue food coloring if desired. To make the mini cotton candy decoration, take pieces of cotton candy and shape into desired size (compacting as little as possible to keep it nice and fluffy), then take a lollipop stick, rinse top of stick under water (this just helps the cotton candy stick) then insert stick into bottom of cotton candy. Repeat to make 12. 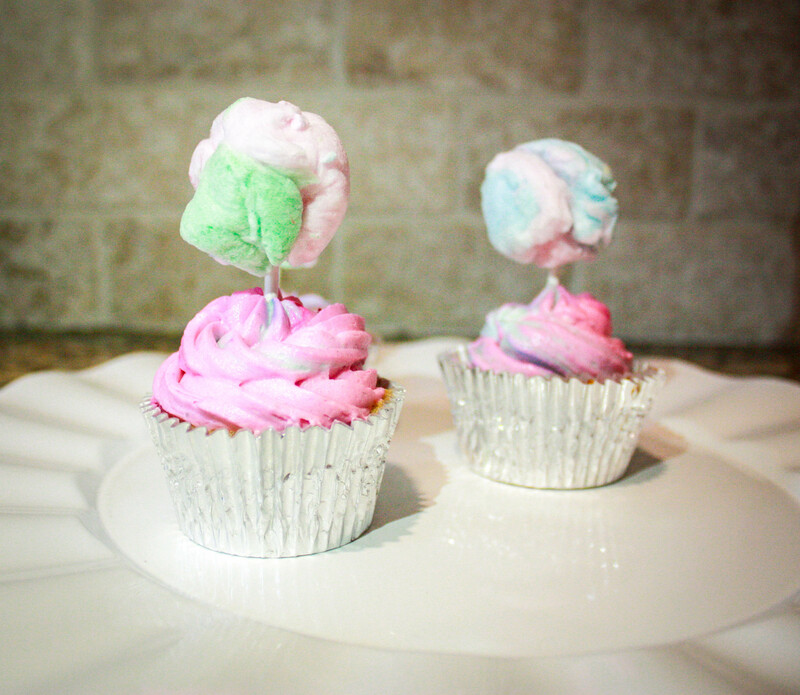 Once cupcakes are cool frost with cotton candy frosting and insert a mini cotton candy stick into each (note that the cotton candy will begin to shrink after about 30 – 60 minutes depending on how humid or hot it may be so wait to make and add decoration until nearly ready to serve). Please feel free to let me know what you think of the recipe and the gift idea! It’s always great to share ideas and feedback.